Athos was originally built in 1964 as a cargo barge to carry sand, grain and wine; it was converted to a hotel barge in 1982. At 101 feet long and 18 feet from side to side, it’s one of the widest barges in the Go Barging fleet. Athos accommodates up to 10 passengers in five double or twin staterooms. 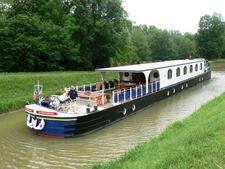 Its route is the Canal du Midi from Sallele d'Aude near Montpellier to Marseillan in the south of France. The staterooms on Athos are quite tiny; at 77 sq. feet (the bow cabin is 88 sq. feet), there isn’t even room for a bedside table. Nonetheless they are bright and cheery, with cupboard space, reading lights and relatively large en-suite bathrooms. All bathrooms, which are decorated in white tile with a blue Greek Key pattern, have a shower, basin and toilet. Amenities include a hairdryer, towels, soap, shampoo, shower gel and conditioner. Rooms are air-conditioned and have central heating. All current is 220 volts (North American appliances need converters) with the exception of the bathrooms, which have a 110 outlet for shaving only. The cabins are located on the same level as the saloon, which is primarily taken up by the large dining table in its center. Two contemporary sofas along one side provide space for indoor reading and relaxing. The saloon also contains a bar, small library and stereo system with CDs. Rows of windows keep the room bright; deep, rich woods line the walls and ceiling, and classy oriental rugs cover laminate wood floors. Most of the socializing and activity take place, however, on Athos' barge-long upper sun deck with its redwood floor. Furnished with tables, chairs, umbrellas, loungers and railings adorned with live plants and flowers, it's a perfect extra room for this itinerary. Guests with mobility issues should be aware that there are several steep steps at the entry to the barge. Meals are served in a single seating, with the occasional al fresco meal on the sun deck. Breakfast consists of a Continental repast with breads, croissants, yogurt, cereal, fruit, coffee and tea. Lunch is three courses served with a specially selected rose wine. Supper is four or five courses, served inside or on the deck, with regional cuisine paired with wine, desserts, cheeses, coffee and liqueurs. The dress code at all meals is resort casual, except for the Captain’s dinner on the last evening, which requires cocktail attire. As on all of the hotel barges in European Waterways' fleet, Athos is an all-inclusive product, with wines, soft drinks, bottled water, beer, liquor and liqueurs, as well as all onboard meals and snacks, included. (Certain vintages of wine and Champagne -- except for the Welcome Aboard greeting -- are not included, but can be provided for a fee.) Shore excursions, usually lasting from two to four hours, typically take place once a day; all entry fees are included with your cruise fare. Optional activities, such as golf and hot-air balloon rides, cost extra. 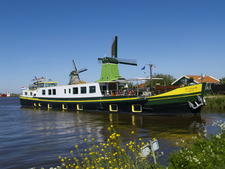 Two air-conditioned Chrysler mini-buses follow the barge's route and are available at designated times for transport. Excursions on Athos might include winery visits and tastings, a visit to an olive press, guided tours through the towns and villages, and a visit to the Noilly Prat Vermouth distillery. Athos carries eight touring bicycles; guests can easily disembark at a lock, ride off to visit a village or two, and catch up with the barge later. The boat also stocks board games, boules, and binoculars -- useful for spotting animals as you glide through the Petit Camargue. 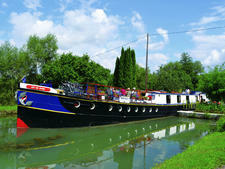 The barge has five crew members: a skipper (captain), chef, tour guide and two hostesses. Gratuities are discretionary and typically average between four and seven percent of the fare paid, given to the Captain for distribution. 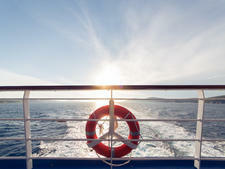 There is no smoking inside the boat; smoking is allowed outside on the deck only. 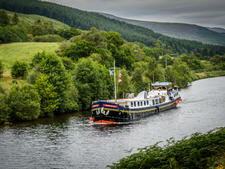 With roomy cabins compared to most hotel barges, Scottish Highlander carries eight passengers around the locks and canals of Scotland's Loch Ness, serving regional cuisine and designing local excursions - including golf. 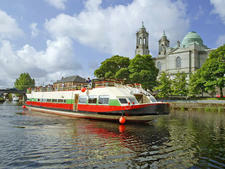 With 10 passengers, the custom-built hotel river barge Shannon Princess II sails in Ireland from the Lough Ree down the Shannon River to Killaloe. 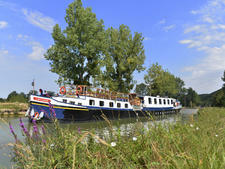 Enchante joined European Waterways in 2009 as a luxury hotel barge with a capacity of eight passengers, sailing Southern France on the Canal du Midi and Rhone River. 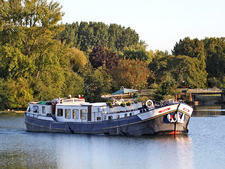 The eight-passenger L'Art de Vivre hotel barge cruises along Canal du Nivernais in Burgundy, France, an infrequently traveled canal; all meals, open bar and most excursions are included. 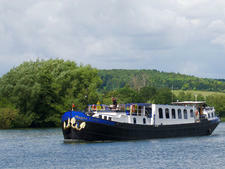 The eight-passenger Magna Carta hotel river barge sails along England's River Thames, one of the few to do so. 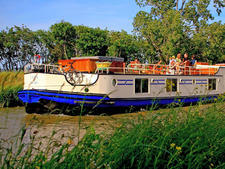 The eight-passenger Renaissance hotel river barge cruises Western Burgundy and the Upper Loire. 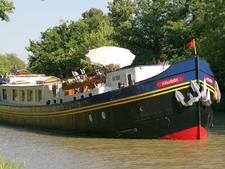 One of the longest barges in European Waterways' fleet, the 13-passenger L'Impressinniste sails small waterways in Provence, leaving from Avignon. 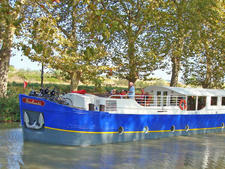 With only eight passengers, Andjodi offers an intimate, all-inclusive barge experience on Southern France's Canal du Midi, with wine tasting, guided tours and bike trips. 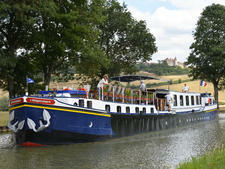 The 13-passenger La Belle Epoque barge cruises through Burgundy on the Upper Burgundy Canal, making stops in small villages and stopping for private wine and foie gras tastings. 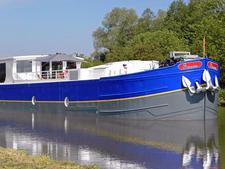 The eight-passenger La Nouvelle Etoile hotel river barge cruises the canals and waterways of France, Holland, Germany and Luxembourg. The 20-passenger La Bella Vita was added to the European Waterways fleet in 2010. 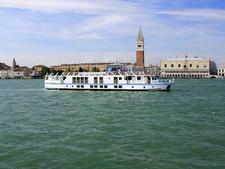 The refurbished barge sails from Venice to Mantua via Italy's famous Canal of the Orphans and Bianco Canal. 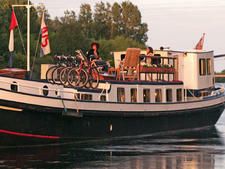 European Waterways' eight-passenger Rosa is a former Dutch "clipper" barge completely refitted in 2010. The six-passenger Clair de Lune is a former freight barge that used to transport cocoa, and was converted into a luxury hotel barge in 1998. With only six passengers, Nymphea is one of the smallest European Waterways' barges and has a draft shallow enough to sail on the River Cher in France's Loire Valley.